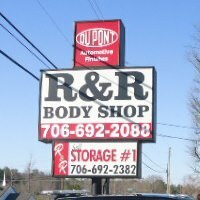 Welcome to R&R Body Shop! We’ve been serving satisfied customers at our location in Jasper, Georgia for over 30 years! Here at R&R Body Shop, we specialize in insurance related accident repair. From a light fender bender to massive damage, we are equipped to handle it all including a pulling system for frame work and a full line paint mixing system. We will handle the insurance hassle for you, no matter the size of the job. Our goal is your 100% satisfaction! Join us for more road races benefiting our community! For more information on races or other local events, Click here to View our Facebook Page!